A lucky cheap find on the Internet. 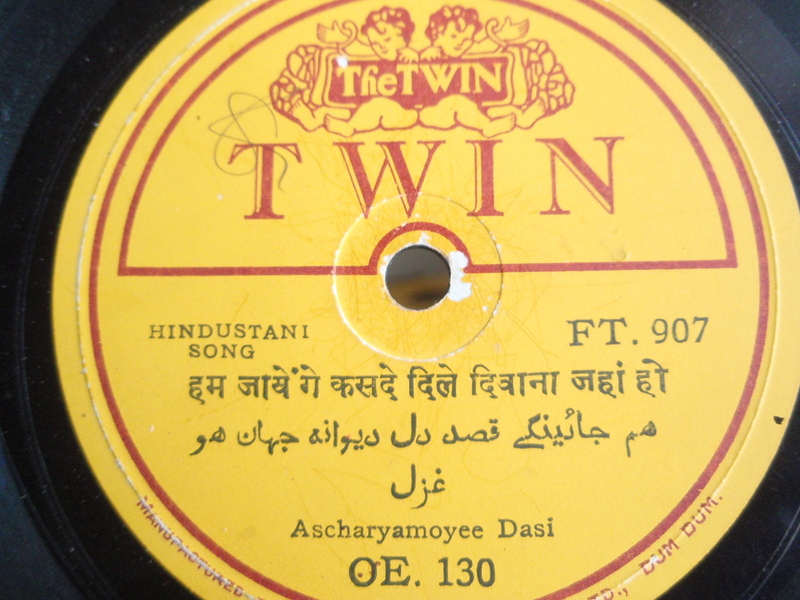 From the obscure Dum Dum, India label The Twin. The legendary and revered female singer Ascharyamoyee Dasi singing a traditional Urdu ghazal: Ham jaayenge kasade dile divaannaa jahaan ho. This is devotional music: in praise of the Most High: with a backing band of harmonium, hand drums, hand claps, and voices: this music seems to be related to the later art of Nusrat Fateh Ali Khan (1948 – 1997), master singer (genius) of Pakistani quawwali music. Super rare in any format: a document as much as a song about a different time in India. I cannot determine the year of this recording. No idea. Maybe between 1935 and 1955?